how to get to ocean park hongkong from new world renaissance hotel?? we want to go to ocean park..whats the best way and route can we take?? Comments for how to get to ocean park hongkong from new world renaissance hotel?? The last bus (CTB 629) that will depart from Ocean Park to Admiralty Bus Terminus during the Ocean Park's Halloween Bash event is at 1:00am. So there's NO problem getting back to Admiralty MTR station by bus during that event period. Taxi option. You can take a taxi from Ocean Park straight to Royal Plaza Hotel at Kowloon area for about 20 minutes drive @ HK$150. A night surcharge should be added to the regular taxi fare of HK$5 - HK$10. Here's more getting there info about Royal Plaza Hotel. Might be attending Ocean's Park Halloween Bash while I'm in HK. The bash is from 730pm-12am. If my frens & i (4px) are to take cab from there back to hotel, how much will it be? Any extra charges after 12am? Or will there be taxi willingly to fetch us back? Any advice? Thanks. Don't think there will be any bus available after 10pm back to MTR stations. Hotel Benito Hong Kong is a 3-star hotel conveniently located at 7-7B Cameron Road Tsim Sha Tsui, Kowloon, Hong Kong. 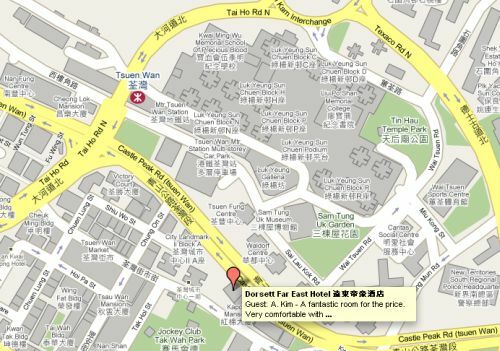 Here's the location map of Hotel Benito Hong Kong with nearby TST MTR train station (Exit B2) access point. Here's the most effecient way to get into Ocean Park from Hotel Benito Hong Kong. From the hotel, take a short walk to the nearby Tsim Sha Tsui MTR station Exit B2. Get into the TST MTR station (subway) and then follow the rest of travel route intruction in here. How do I get to Ocean Park hongkong from Hotel Benito Hong Kong? How much will it cost me? Thanks. I suggest you take this route on Saturday, Sunday at Disneyland. Going to the Victoria Peak from Ocean Park then back to Tsim Sha Tsui by Star Ferry from Central Pier is a very scenic and memorable route (highly recommended - refer to map below). Also, at TST promenade you can visit the Avenue of Stars then watch the Symphony of Lights at 8:00pm and your hotel is walking distance from there. A taxi from Ocean Park straight to the Peak Tram is about 15 minutes drive at HK$80. From the Peak, take Tram back to the Lower Tram terminus. You can take the bus 15C at nearby Peak Tram Bus Terminus for about 10 minutes ride @ HK$4.2 / person to the Central Pier Bus Terminus (walking distance to the Central Star Ferry pier) or take a taxi for 9 minutes drive at HK$20. Get into the Star Ferry at Pier no. 7 for about 9 minutes @ HK$2.5 / person ride to Tsim Sha Tsui Ferry Pier. Walk along the Tsim Sha Tsui promenade. Taxis in Hong Kong can only accommodate 4 adult persons (5 person with kids, max). There's NO MPV or SUV type of taxi in HK that can accommodate more than 5 persons. Hotel Nikko Hong Kong and InterContinental Grand Stanford Hong Kong are 5-star hotels conveniently located at Mody Road, Tsim Sha Tsui East, Kowloon, Hong Kong. Here's how to get to Ocean Park from Hotel Nikko Hong Kong and Intercontinental Grand Stanford Hong Kong by MTR trains + Bus 629. Take a walk to the nearest MTR station which is the East Tsim Sha Tsui then to the adjacent Tsim Sha Tsui station. Once you're already in Tsim Sha Tsui station, follow this instruction here. 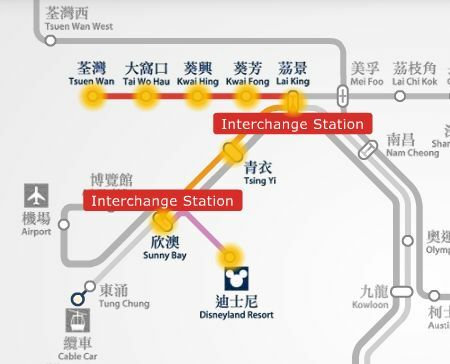 Here's how to get to HK Disneyland from Hotel Nikko Hong Kong and Intercontinental Grand Stanford Hong Kong by MTR trains. Get into the East Tsim Sha Tsui MTR station and take the West Rail Line trains and get off at Nam Cheong station. Interchange trains to the Tung Chung Line going to Tung Chung and get off at Sunny Bay station then interchange trains to the Disneyland Resort Line heading straight to Disneyland. Total train travel time is 32 minutes @ HK$16.6 / person using octopus card. We are a group of 7 (5 adults including one senior on wheelchair, one child and one infant). We wish to go to Peak, Ocean Park and Disneyland. I doubt whether one taxi will be able to accommodate us. If they allow, it is ok with us. Are taxis easily available outside the hotel? Shall we hire MPV? Or we take MTR (won't it be difficult)? The hotel shuttle provides access to East TST MTR station whereas we need to board MTR for Admiralty from TST MTR. Is the subway access from East TST MTR to TST MTR free? How long does it take? Shall we explore star ferry for return from Peak on Friday evening? We have Saturday and Sunday to cover Disneyland and Ocean Park. Which day is advisable to go to which theme park? Please advise. Going to HK Disneyland or Ocean Park from Dorsett Far East Hotel by taking a Taxi will cost HK$220, 30 minutes travel time. We highly recommend that you'll take the MTR trains instead and here's how to get there from the hotel. With just 5 minute time, walk from the Dorsett Far East Hotel to the Tsuen Wan MTR station. Take the Tsuen Wan Line trains and get off at Admiralty station and take Exit B, 30 minutes, HK$ 11.5. Upon exit, get on the special CityBus No. 629 for about 25 minutes, HK$10.6, an express bus travel between Admiralty (West) and Ocean Park (main entrance). Hotel Nikko Hong Kong is situated at 72 Mody Road, Tsim Sha Tsui East, Kowloon, Hong Kong. The best way in getting to Ocean Park from Nikko hotel is by taking the MTR trains from Tsim Sha Tsui MTR station to Admiralty station, and then next to the express bus CTB 629 in Admiralty MTR station exit B or just follow the procedure that have been written on top of this page. I'm now living at Hotel Nikko Hong Kong, how to take bus or train or ferry from my hotel to Ocean park. I don't want to take a taxi, please guide me the best way in getting there. With just 5 minute time, you can walk from the hotel to the Tsuen Wan MTR station, here's the location map between the MTR station and hotel. Take the Tsuen Wan MTR trains heading towards Central and get off at Admiralty MTR station (30 minutes @ HK$11.8) then take the Exit B and get on the special Citybus CTB 629 (HK$10.6) that will bring you to Ocean Park, here's the MTR route map. The park tickets are available at the Bus terminal (upon exit from trains) or you can have it at the parks' entrance. You can also walk through the City Landmark and Nan Fung Centre to the MTR station. People who want to travel to the North West New Territory, including Tuen Mun, Tin Shui Wai and Yuen Long by the fastest and most convenient railway transport network, can take the newly constructed West Rail line; and it is only about 10-minute-walk time between the hotel and the station. Renaissance Kowloon Hotel is conveniently located in the heart of Tsimshatsui's business, cultural, shopping and entertainment scene. A short walk along the adjacent harbour front and the Avenue of Stars attractions. Please get into the East Tsim Sha Tsui station (East TST Exit J nearest to the hotel). 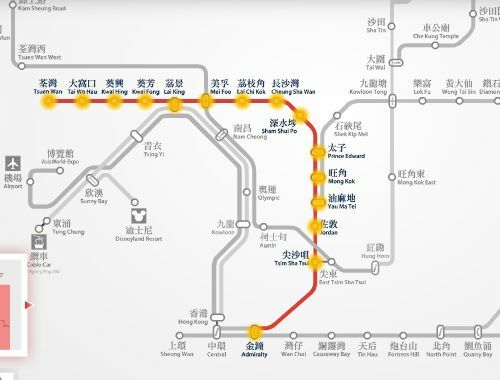 While in the subway, take a about 10 minutes walk to Tsim Sha Tsui station and get on the Tsuen Wan Line train towards Central station and get off at Admiralty MTR Station. Then Look for Exit B where you can find the CityBus CTB 629 station opposite to the Far East Finance Centre outside Lippo Centre. Get on the Bus 629 that will bring you to Ocean Park. Taxi from Dorsett Fareast to Ocean Park. How much it will costs if im going to take taxi from Dorsett Fareast to Ocean Park. How much will we cost for taxi from "dorsett hotel" to "Hk Disney Land"
How much would it cost for a taxi in Hong Kong going to the popular tourist spots, like Ocean Park and Disneyland..